This year I want to focusing on creating new color gradations in my fabric line and implementing them in my new quilts. I have already added one new color gradation to the fabric page on my website, Purple Plum. I want to add new gradations each month for the rest of this year. I hope you will find time to look at the fabric gradations and send me a comment. I would love to hear from you. Perhaps you have an idea for a color gradation that I might try. Please blog or email me your ideas. To Celebrate 2013 all our fabric gradations will be on sale through the month of January for$20.13. How appropriate to start the new year. A good way to start out the new year is with a 1/2 yard of rainbow gradation and 1/2 yard of blackened rainbow gradation. I use these two fabrics all the time when I am working on my art pieces. They allow me so many color choices that all work well together. 1/2 yard of blackened rainbow and 1/2 yard of rainbow gradation. My 2013 calendar is ready and waiting for you to order. 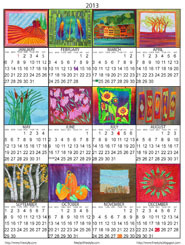 This colorful calendar is always a great little gift for one of your quilting buddies or a bright addition to your own studio space. It is a collection of some of the art quilts I made in 2012. 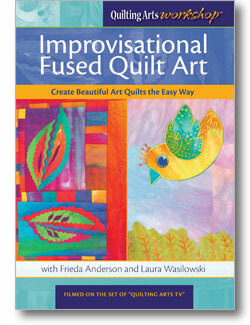 Pre-Order: Improvisational Fused Quilt Art: Create Beautiful Art Quilts the Easy Way with Frieda Anderson and Laura Wasilowski. OR you can download it right now!! Just when you thought Easy Buttons didn’t exist! Okay, there may not be an Easy Button in life but you CAN have one for quilting! Join Laura Wasilowski and I to learn our amazingly easy method of creating art quilts using fusible web. Quickly translate all of your exciting ideas into beautiful art quilts when you construct with fusible web. You’ll be in the best of hands with us and find our wonderfully collaborative approach to be both entertaining and informative, and gain a wealth of valuable tips and techniques. After getting an overview of tools and construction methods, you’ll be on your way to creating one-of-a-kind improvisational fused art quilts with step-by-step guidance from each teacher. Plus, learn how to stitch your quilts by machine, add hand embroidery, and finish your quilt with a flourish. Before you know it, you’ll discover that being a fuser is an absolute blast. Laura Wasilowski and Frieda Anderson having fun and making art. Thank you for being a loyal customer and friend. I hope you will share this newsletter with your quilting buddies and become a follower on my blog too. It is free to join the blog and will give you daily tips, techniques, and information that you can use in your quilting adventures. Everyone who signs up for my blog or gets a friend to sign up for it will receive a free 1/4 yard of my hand dyed fabric. Just send me your name and address. I love your Art Work, so it is no surprise that you website looks really good. I love it! I still have to do mine.